Heat a medium skillet over medium high. Add the turkey to the pan and cook, breaking up with a wooden spoon until browned, about 6 minutes. Add the garlic and saute 1 minute. Add the red bell pepper, carrots and water chestnuts and saute another 4 minutes. Add the hoisin sauce and stir to coat everything. Spoon the turkey mixture into each lettuce cup. Garnish with scallions and drizzle each with a little soy sauce. Don't you want to just cuddle these adorable little lettuce cuppies? I remember the first time I experienced a lettuce cup or wrap of some sort. I had just moved from Arkansas to Kansas City, was freshly engaged and I felt like a young spring chicken. One afternoon we were exploring the city, and we got hungry, of course. We sat down at this cool little Asian joint in one of the hipster pockets of the city, and with one swift motion, Aaron ordered us a round of sauv blancs and the lettuce wraps to split. Me, "Okay now, these are LETTUCE CUPS? With STUFF INSIDE? Like, INSIDE THE CUPS?" Him, "Yeah! Instead of a tortilla shell, it's a lettuce cup." Me, "OHHH, so it's like a lettuce TACO? But with Asian fillings? INSIDE THE LETTUCE SHELL?" Him, "Yes! Trust me, you'll dig them. Amazing flavor and no carbs. Not that you need to worry about that, though." as he nudges and winks at me. Me, "Ooo, I'm excited! Leaves room for 45 more glasses of wine!" A minute or two later, I had in front of me, the most vibrant and crisp plate of lettuce cups anyone had ever seen. I looked at Aaron. He looked at me. Drool fell out of my head. He wiped it up. I took a bite. I closed my eyes. I took a nap. I dreamed of the beautiful times I was living. I woke up. I finished my plate. And I've never been the same since. 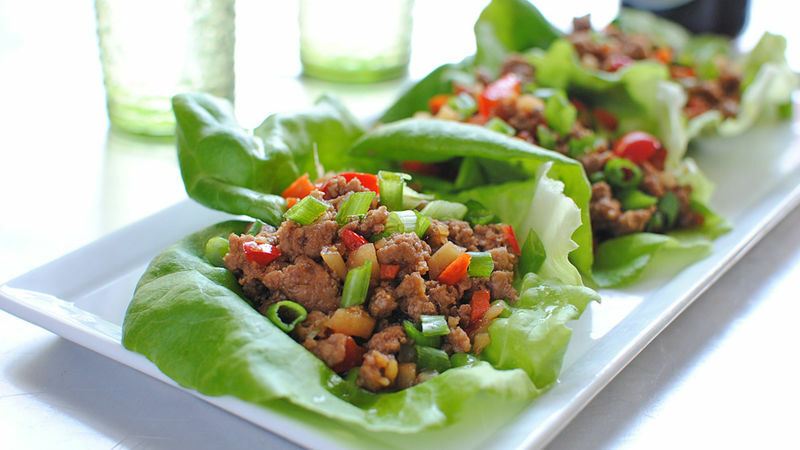 Grab some turkey, water chestnuts, garlic, ginger, carrots, red bell pepper, some hoisin sauce, scallions and a lettuce of your choice. I went with butternut this time. Get your turkey all nice and browned. Mmmmm, season with salt and pepper. Double mmmmm. Add the veggies and sauté some more. Triple mmmmmm. Squirt in that hoisin sauce. Quadruple mmmmmmm. Spoon the filling into the lettuce cups and arrange on a plate or platter. Fivetuple mmmmmmmm. Drizzle with soy sauce and slide those cuppies into your mouth. Sixteplet MMMMMMM. Bev understands that the word "sixteplet" refers to humans. Wait, does it? For more musings, visit her blog at Bev Cooks and her Tablespoon profile.